Eco R Geo: Cyclone Winston: Fiji death toll rises. The cyclone will most likely bypass Vanuatu and New Caledonia. Cyclone Winston: Fiji death toll rises. The cyclone will most likely bypass Vanuatu and New Caledonia. The death toll in Fiji is believed to be as high as 10, after Cyclone Winston struck the country over the weekend. The island nation declared a state of emergency and a curfew as the Category 5 storm hit made landfall on Saturday. Wind gusts of high as 325km/h battered the country, in the worst tropical storm in Fiji's history. Damage from the cyclone is estimated to be around NZ$154 million, with New Zealand sending in its first aid supplies yesterday. Air New Zealand, which cancelled flights in and out of the city of Nadi on Sunday said it would be resuming services today. 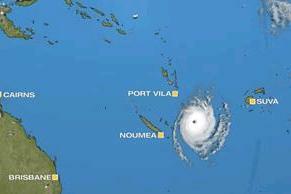 The New Zealand MetService says the cyclone will most likely bypass Vanuatu and New Caledonia. "We expect it in the coming hours this morning to turn southwest and then southwards and start drifting southwards in the general direction of New Zealand," says meteorologist Mark Todd. Initial support, including an Orion P3 maritime patrol aircraft, has been sent to Fiji to respond to Tropical Cyclone Winston, New Zealand Foreign Minister Murray McCully said Sunday. McCully said in a statement that a New Zealand Defence Force aircraft Orion P3 has departed to help the Fiji government to carry out aerial surveillance and damage assessments. The New Zealand government is in close contact with of Fiji authorities and stands ready to assist Fiji people as they deal with the aftermath of Cyclone Winston, said McCully. The New Zealand government announced 50,000 NZ dollars (33,167 US dollars) OF support via High Commission to ensure it can respond rapidly to urgent requests from the Fiji government. Pre-positioned relief supplies of up to 170,000 NZ dollars (112,767 US dollars) were authorized by New Zealand government, which is held by non-government partners such as Rotary and UNICEF in Fiji. McCully said New Zealand would work with local authorities to determine further supports. The category 5 tropical cyclone swept through Fiji between the Pacific island country's main island of Viti Levu and northern island of Vanua Levu. Five people have been confirmed killed by the severe tropical cyclone. Fiji has launched a clean-up after the most powerful cyclone in the Pacific island-nation's history left a trail of destruction, killing at least six people, destroying homes and damaging infrastructure. The storm struck the popular tourist destination overnight Saturday, packing wind gusts of 325km per hour, according to the UN humanitarian agency OCHA. OCHA said six people were killed during cyclone Winston, the first storm system to hit Fiji measuring a maximum category five. "Homes have been destroyed, many low-lying areas have flooded," Frank Bainimarama, prime minister, said earlier on Sunday in a statement. As a result struck Fiji on severe tropical cyclone “Winston” has died, according to the latest data, 20 people. It is reported by FBC News, citing the National Bureau for disaster management. It is known that one of the deceased was 97 years of age. People mostly died, drowning or getting injuries due to the collapse of buildings and by wind borne debris. In addition, seven fishermen out to sea on Friday, 19 February, are missing, communication with them is absent. 68 reception centres stationed 701 family from different areas. Just evacuated currently 4184. The hurricane “Winston” was assigned to the fifth, highest category of power. The wind speed exceeded 200 km per hour, and a gust speed of 300 kilometers per hour.